Showing the ol’ girl some love – HubNut – celebrating the average! But the Discovery came first in the queue, because it’s new and I’m still all excited about it. As a warm-up, I failed to change the gearbox oil due to a combination of unsuitable spanners and not enough oil. A poor start. Then I decided that new engine oil was a good idea. I’m very grateful for the fact that my wife has a large collection of buckets. With a 6.9-litre engine oil capacity, I’d need a pretty big bucket for the drain operation. I wasn’t too pleased to discover that both the sump plug and the oil filter were loose – both were leaking. Hopefully both are now tighter. By the way, the above shows the advantage of an uneven driveway. By putting one front wheel on a ramp, the car is level but the ground sloped sufficiently to allow really quite good access to the underside. Brilliant. I also greased up the propshafts while I was under there, and admired how solid everything seems to be. I then enjoyed a nice test drive in the pouring rain. Gearchange aside – it’s ever so vague and 2nd gear still crunches – I really do like spending time at the wheel of this thing. I’m tuning in to how it behaves now – it can’t match the majesty of a Citroen, with its independent springing – but it is comfortable. The torquey engine means its relaxing too, as there’s no point going beyond about 2500rpm. This is it’s biggest strength compared to the Maverick – the petrol engine in that had very poor low-down grunt and was frustrating to drive. 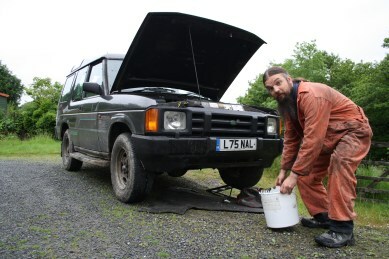 It was almost as thirsty as a V8 too – not the right engine for a 4×4 at all. This didn’t seem to stop Land Rover putting a 2-litre, 4-cylinder engine into the Discovery for a time. The Mpi is not one of Land Rover’s best efforts. The Tdi is much more like a truck engine, which suits the slightly-agricultural Disco perfectly. I digress. Once the weather improves, hopefully I can complete the service. Still some filters to replace, and the brakes need inspection.